Reel Tech Custom Reel Solutions are packed with patented technology and safety features. With one of the Largest standard ranges of hose and cable reel designs in the world, for applications in all Industries including government, fire and rescue, mining, oil and gas, food and beverage processing, Reel Tech knows that although our range is vast, sometimes the needs of our world wide customers are as specialised as the industries and applications they are involved with; that is why Reel Tech custom solutions can assist with a custom designed and manufactured reel to meet any specification or application outside the standard range. Clean sheet design as it is called, starts with a Reel Tech custom reel application intake form, allowing the customer to outline certain key design requirements such as hose or cable size, weight, length and bend radius; the operating environment which can vary from highly corrosive, highly volatile or meet certain hygienic needs. 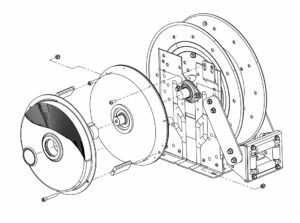 The delivery of fluids, gases or amperage always vary depending on the application, that is why Reel tech’s engineering team has the past experience to know what works best on custom reel applications. Reel Tech can also provide their own design solutions for safer rewind speeds, easier de clutching to prevent pull force strain injury on payout and even unique auto hose levelling and remote-control technology, allowing full automatic autonomous operation if required. If you need a complete package with hose or cable, control systems and more, just ask Reel Tech for their complete custom reel packages, that can be shipped worldwide. Reel Tech’s full in-house CAD design and construction team has years of actual field experience supplying Reels to the toughest environments and applications. With a proven track record as a defence contractor supplier, emergency services and petroleum Industries, our expertise in design to meet such requirements as quick deployment lifting, earth quake vibration, custom paint finishes and unique materials of construction; means that if Reel Tech can’t supply a Standard off the shelf Reel Solution, then they’ll just design and build you one. Contact us for reel support.